We're always on the hunt for the best dog products available and we suddenly thought - what's the point in us knowing if we don't tell you? Continuing our series of the Best Dog Products, we've been hard at work finding some of the latest and best seasonal products. So, without further delay, here's K9 Magazine's countdown of a few of the best travel products for you and your dog! Travel Eze Tablets – A natural herbal product for Dogs & Cats. Containing natural herbal ginger (Zingiber Officinale BP), which reduces the effect of vehicle motion and so helps to make travel more comfortable for pets. Johnson’s full range is exclusively available to the Pet Trade, from all Pet Stores, Superstores and Garden Centres. See the website for full details. Urban Pup Car Seat Dog Cradle – The perfect way to make sure your dog travels safely! 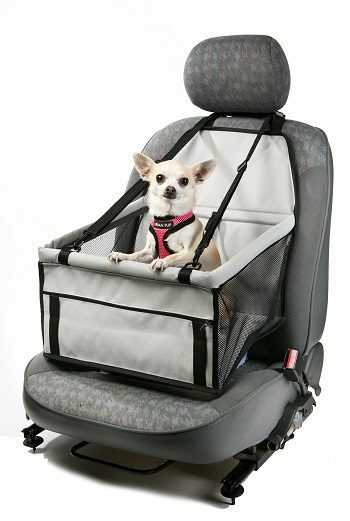 This car seat dog cradle can be attached in the car within minutes and features an integral strap that can be attached to any harness to keep your dog secure and safe. Your dog can either stand up, sit down or lie down for a snooze while safely restrained and for added safety, the car seat belt can be fed around the straps on the base. The car seat dog cradle will allow you to concentrate 100% on the road ahead knowing your dog is safe. Plus, no more dog hairs on the actual car seats! Wag N Go Dog Travel Bag – Designed by a pet traveller and dog lover, just like you, to provide an easier, happier and faster solution to your dog’s needs while on the road. Whether going on a trip and bringing Fido along, or leaving your best furry friend with a sitter while you’re out of town the Wag N Go dog travel bag will simplify your life and make your pet feel right at home wherever they are. The Wag N Go Kit includes: two Fresh-Seal Containers for toys/treats, a Silicone Travel Bowl, a Large Double Fleece Sleeping Blanket and roomy zip pockets – all packed into an easy to carry slim line bag. Scruffs Balmoral Boot Bed – This boot bed is an ideal travel accessory for your dog. Suitable for most cars, the ribbed sleep area provides comfort for your dog while protecting your boot from dirt and odour. To use, place the bed on the floor of your car boot and unroll to protect your dogs legs as they get in the vehicle. Then, simply roll the cover up to form the forth side of the bed. Machine washable, it’s available in Blue, Black or Brown.